IRAN. Tehran. 1977. Courtesans bow to Shah Mohammad Reza PAHLAVI during a Salaam ceremony celebrating the 58th anniversary of the Monarch in the Golestan Palace. 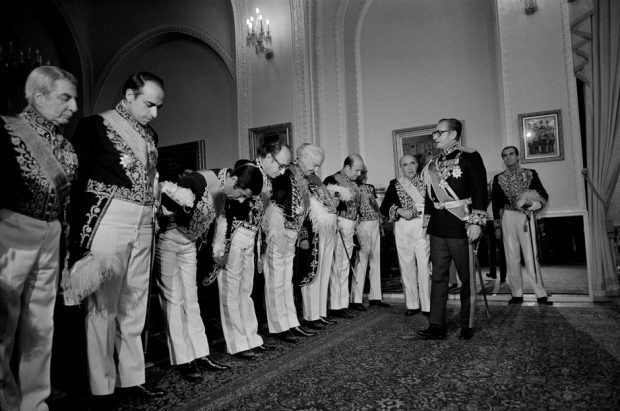 On the right of the Shah is Amir Abbas HOVEYDA, formerly Prime Minister and now Court Minister. On the left of photo is General Hassan PAKHRAVAN, Ambassador and first chief of the SAVAK, the much feared political police.